that he has given up writing. that he has a surprise for them. "Look! It's ten o'clock," whispers a tradesman. "How do you know?" asks his wife. "The gentleman with the Canadian wife is taking the trolley." This gentleman with the Canadian wife, who serves as a clock for certain residents of Lausanne, is about seventy years old. He always wears the same wide-brimmed hat, and carries in his mouth the same pipe, like that of a minor civil servant. No one ever comes with him. He leaves to stroll along the banks of the lake or the rue de Bourg, the Saint-Honoré suburb of the city. Sometimes he stops in a café. He exchanges some pleasantries with the patron and drinks a glass of mineral water. This meticulous walker is undoubtedly retired. You have but to note his casual pace, his absence of a goal, to be sure. And yet, this anonymous retiree is famous. How could he not be famous, when he is perhaps the richest pensioner in the world? His retirement is recent. He decreed it one fine morning, just like that. 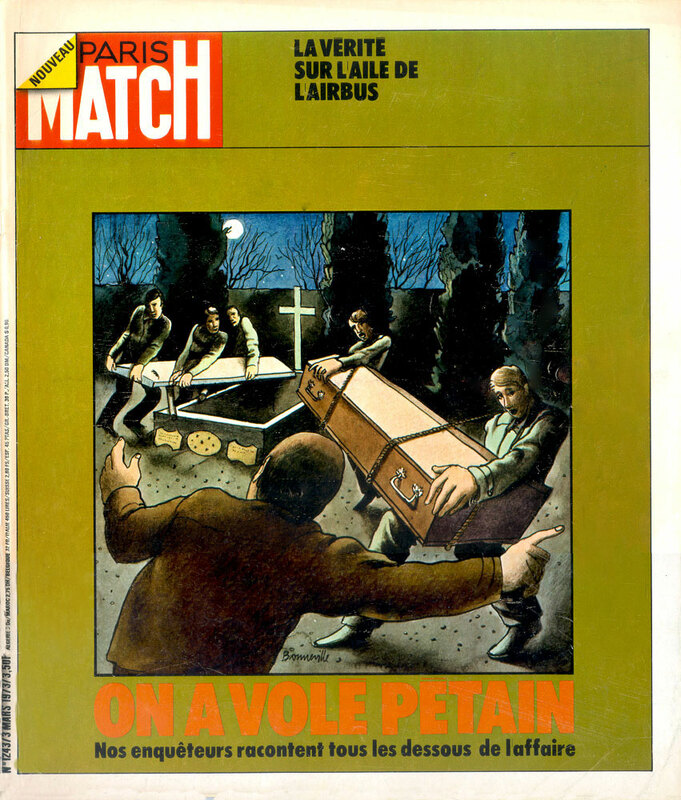 Georges Simenon decided to kill Maigret and never more to write novels. He sold his six cars, including a ten-year-old Rolls-Royce. He dismissed his nine servants who had been long in his service. And then he put up for sale his house at Epalinges, ten kilometers from Lausanne, on the road to Berne. In the city, this extravagant home was often ridiculed. They called it "the dairy" or "the clinic". Admittedly, this ultramodern twenty-five room house is not common. Its windows lend a beautiful view of Berne's Alps and the Savoie. But in the garden there is not a tree. Instead there are ten statues: nine of Maigret and one of Simenon himself. Nothing has been forgotten  a generator to provide for a power failure or general strike, an operating room for an extreme emergency. There is an Olympic swimming pool whose water is changed automatically every two hours. But Georges Simenon worked there in a vast library whose shelves were filled with his own works, translated into every language. Since the novelist creates his work shut in a room which he doesn't leave for eight days, Denise even had a service elevator installed whose only function was to bring up Georges's meals. And then, in 1963, Denise Simenon fell ill. They spoke of a nervous breakdown. She left Epalinges, never to return, leaving Georges alone with his children. The children that the father of Maigret will lose one by one. Marc, the eldest, a film-maker, married Mylène Demongeot and lives near Paris. Johnny, in turn, leaves for training in a publishing house in Paris. Some months later, he will take off for America. Marie-Jo will follow his path, and sign up for the Simon course in Paris. Simenon is left with only his youngest, a boy of fourteen. The dream house has become a concentration camp nightmare. The overly-well designed and too-large house quickly overwhelmed the novelist. In two days, he put Epalinges in the hands of a real estate agent with orders to sell it for 450,000,000 old francs. Now he has bought a seven-room apartment on the eighth floor of a gray marble tower, avenue de Cours, overlooking Lake Geneva and the Lausanne cemetery. It was there, on Tuesday, February 13, that he celebrated his "seventieth," in the company of his Italian housekeeper Thérèse, his youngest son Pierre-Chrétien, and Yolande, their maid, nicknamed Yol. A very modest celebration, without great joy, in an existence where, henceforth, all is adjusted to the second. After lunch he takes his nap. Then he either reads or writes. In the evening, he watches the news on television and awaits the return of his son Pierre-Chrétien, a day student at Béthusy private school, and goes to bed early, before 10:00 pm. It is his housekeeper who is the metronome of this existence without surprise. It is she who awakens Simenon, tells him it's time for his walk and hands him the pills that he must take for his bouts of dizziness. Sometimes, she goes with him to the rue de Bourg, to Besson's, the "Davidoff's" of Lausanne, where every three weeks he buys twelve 50-gram boxes of "Maigret cut" tobacco made especially for him by Dunhill in London. He very rarely goes to restaurants. He was seen, not long ago, at "la Grappe d'Or," at the foot of rue Bourg, the best restaurant in Lausanne, where he always chooses a filet of beef Stroganoff and "Passuger" mineral water. On the other hand, he hardly ever goes to the Beaurivage Hotel or the Palace de Lausanne, where, not so long ago, he took his children to dinner. 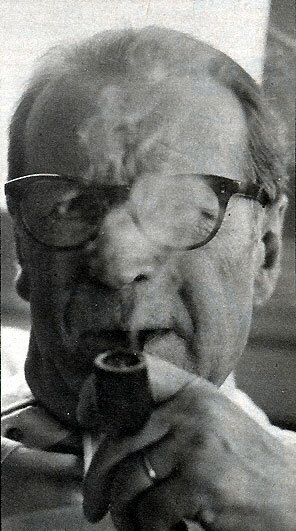 When they question him on his projects, Georges Simenon shakes his head and answers, "Let me enjoy my retirement!" "Let me enjoy my retirement." His children don't believe him. They are convinced that their father's exit is a false one. According to them, he is simply regaining his strength before rushing into new literary adventures. One day, he had told to them, "I could never stop writing, I don't know how to do anything else." It is hard to draw a conclusion. Who could tell us? Simenon has nearly abandoned all his friends. The Achards haven't seen him for years, although Juliet is the godmother of his youngest son. The Chaplins, though living in Switzerland, are not more favored. As for the Chief of Police of Geneva, who often came to Epalinges, he died last year of a heart attack. At this point, his sole intimates are physicians. Dr. Cruchaud, a general practitioner who has been with him for years. Dr. Dubuis, a gynecologist. Dr. Charles Durand, psychiatrist at the Prangins hospital. Georges Simenon always had a weakness for medicine. He subscribed to all the specialized medical magazines and followed European medical conventions closely. In Liège, his mother Henriette kept a family pension frequented by Slavic students studying medicine. From contact with them, Georges discovered his vocation. He would relieve the suffering of men. The death of his father when Georges was fifteen put an end to this dream. His mother, suddenly poor, could no longer put up with long and expensive studies. Georges became a journalist at La Gazette de Liège, a journalism that led him to the novel. It was there, in his books, that Simenon could pour out all his fantasies of a failed physician. For all psychologists of profession, Maigret is less a policeman than a physician of the body and soul. He tries as much to discover the truth as to understand the motives of the criminals, never allowing himself the liberty of judging them. But this clairvoyance didn't relieve Simenon. The tormented worrier needs physicians. They alone can momentarily reassure him. Physicians can therefore help him, but, at the same time, he is afraid of them. He has some reasons to dread them. So I walked from the Bouvons forest to a radiologist. Behind the screen he began to examine me without saying anything except: 'Turn a little to the left', 'a little more there...' (I have described the scene in les Volets verts). I broke out in a sweat, and began to feel afraid. I said to myself, 'Why not?' All those 'me's embarrassed me. And it became my book Pedigree. The fool of a radiologist had been mistaken! He had taken a shadow in my chest for some kind of angina. And I had lived two years like a dying person because of that..."
Simenon, in recent years, has endured dizziness caused by cervical osteoarthritis, but without serious consequences. His physicians have succeeded in attenuating the episodes, though without making them disappear. Hasn't the writer suddenly remembered again the forest of Bouvons? But, this time, he doesn't have to cling to life without his resource: his writing. His old past he exhausted in Pedigree. And wasn't he often reminded that his uncle Léopold had died as a tramp? He was always haunted by Léopold. One day, Doctor Rentchnick of Geneva asked him, "How can live you in this sinister Epalinges house?" Simenon answered him smilingly, "Epalinges, is my mooring. Without this shack I would let myself go adrift." Won't Simenon be set free of his moorings? His family and his doctors believe not. Like his hero, Monsieur Monde, Simenon, who changed his domicile more than thirty times, is perhaps trying to escape his past. And to take flight once more, to become again a writer, this time rid of the novelistic universe that he has towed behind him for more than fifty years.